This selection of special recipe cat food from Waitrose offers a convenient and nutritious way to care for your pet. Flavours included are; chunks in sauce with tuna, chunks in jelly with lamb, chunks in gravy with beef and chunks in gravy with chicken. 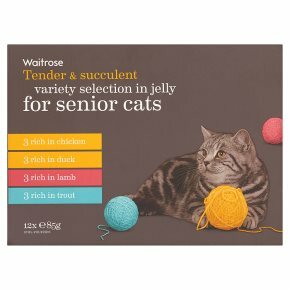 variety Selection in jelly is a complete pet food for senior cats aged 8 years and older. Meat and Animal Derivatives, Fish and Fish Derivatives (14% Trout), Minerals, Various Sugars, Oils and Fats, Derivatives of Vegetable Origin. Additives: Nutritional Additives; Vitamin D3 100 IU/kg, Vitamin E 15 mg/kg, Calcium iodate, anhydrous 0.8 mg/kg, Zinc sulphate, monohydrate 39mg/kg. Emulsifiers: Cassia gum 1.3 g/kg. Meat and Animal Derivatives (14% Lamb), Minerals, Various Sugars, Oils and Fats, Derivatives of Vegetable Origin.